მაკაო (澳門/ Aomen / Macau) – ჩინეთიშ ავტონომიური ართული, პორტუგალიაშ ჸოფილი სპეციალური ტერიტორია ობჟათე ჩინეთიშ ზუღაშ წყარპიჯის. აკმოდირთუ ჩქონშე დო მუსხირენ მორჩილ კოკშე. ჩინეთის დართჷ 1999 წანაშ ქირსეთუთას. ორთა - უმაღალაში ჭურჭული: კოლოანე ალტო 174 მ; კოკეფი (კვ.კმ) - კოლოანე 7,7, ტაიპა 5,7; კლიმატი - ტროპიკული. მახორობა - 457.000, თინეფს შქას 95% ჩინარეფი, 3% პორტუგალიარეფი. ადმინისტრაციული ცენტრი - მაკაო (190 ვითოშ). ნინეფი – ჩინური (კანტონური), თაშენე გოფაჩილი რე პორტუგალიური. თარი რელიგია - ბუდიზმი, კათოლიკეფი - 6%. ერუანული მიშნაველი (1 შურშა) - 16,000 $. Fung, Bong Yin (1999). 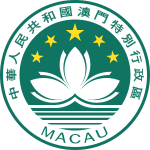 Macau: a General Introduction (Chinese). Joint Publishing (H.K.) Co. Ltd.. ISBN 962-04-1642-2. Cremer (Editor) (1988). Macau: City of Commerce and Culture. Univ of Washington Pr. ISBN 0295966084.
ჟან ბერლი, Jean A. (1999). Macao 2000. Oxford University Press editor, Oxford, United Kingdom. ISBN 0195920740.
ჟან ბერლი, Jean A. (2000). Macau's overview at the turn of the century. St. John's University Institute of Asian Studies editor, New York. De Pina-Cabral (2002). Between China and Europe – Person, Culture and Emotion in Macau. Berg Publishers. ISBN 0826457495.
თე ხასჷლაქ ეკონიას გეახალუ 18:39-ს, 30 მარაშინათუთა 2018-ის.